Earlier this week, Aleteia published a two-part interview with me "all about choirs" — their historical origin and role in the liturgy, the special qualities of polyphonic music, the pro-choir teaching of the Second Vatican Council, the commentary of John Paul II on the real meaning of active participation, Benedict XVI's teaching on sacred music, congregational singing, orchestral Masses, children’s choirs, and resources for budding groups. Part I, "Sacred Music: Echoing on Earth the Heavenly Choirs"
Part II, "Church Choirs: The Good, the Bad, and the Ugly"
Over a few centuries this acorn grew into the majestic oak tree that we call Renaissance polyphony — from the School of Notre Dame to Machaut, Ockeghem to Du Fay, Josquin to Palestrina, Victoria to Byrd. The resulting body of work, comprising thousands upon thousands of Masses, motets, and other choral works, is unlike anything the world had ever known before or has ever known since. It is music of spiritual peace and sensuous beauty, prayerful intensity, spacious thought, purified emotions, lofty aspirations, modesty and naturalness. It flows along with the gentle rhythmic pulse of chant, it sparkles with the suppleness of the medieval modes. As music of the highest artistic excellence, inspired by centuries of Catholic faith and nurtured in an age of liturgy in its full splendor, Renaissance polyphony is second only to chant itself in its perfect suitability for the public, formal, solemn worship of God. It is music wholly in service of the sacred text and of the sacred liturgy. It is sanctified and sanctifying music. The popes from St. Pius X onwards, concerned about the replacement of congregational chanting with second-rate concert performances, urged the faithful to be instructed in chant so that they could sing the parts of the Mass that pertain to them. (Vatican II stated explicitly: “Steps should be taken so that the faithful may also be able to say or to sing together in Latin those parts of the Ordinary of the Mass which pertain to them,” Sacrosanctum Concilium [SC] 54.) 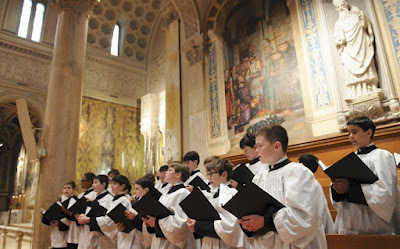 The healthy instinct of the Church has always been for a wise balance between liturgical singing in which everyone can participate and liturgical singing that is rightly entrusted to choirs or scholas. As John Paul II and Benedict XVI taught, choirs dedicated to this more exalted repertoire perform a genuine service for the faithful themselves, by lifting their minds to the sublime beauty of God and prompting interior acts of praise, blessing, adoration, glorification, contrition, and thanksgiving. John Paul II speaks here of how important it is for the faithful to learn the art of “active listening.” Here is where some soul-searching is necessary. How often do we let the words of the liturgy float right over our heads, while our minds are a thousand miles away? How often do we say the words of the liturgy without even being conscious we have said them? The vernacularization of the Mass had a lot to do with this problem, since it fostered the illusion that as long as something is in your native language, you’ll pay attention to it and make it your own. Not only is this not necessarily true, but experience has often shown the opposite. The vernacular is our comfort zone, where we can take much for granted, where “half-listening” is terribly easy. On the other hand, when people encounter Latin in the liturgy, this strange and hieratic language often compels them to sit up and pay attention, to wonder what is being said and why. The very language proclaims that we are engaged in an act that is not an ordinary affair, that we are entering a time and space set aside, consecrated to God alone. [T]he faithful may internalize the chants and music of the liturgy, so that the message they carry, particularly through the beauty of the melodies and harmonies, become the seed of meditation and contemplation, drawing us more intimately into the mystery of God. I would go further and argue that we are more in need of the earnest beauty of traditional sacred music today than ever. For many who are trapped within the narrow and artificial confines of modernity, great sacred music—especially from past centuries—can help us break free and reach beyond those confines, to catch a glimpse of the wonder of God, the enchanted cosmos, and the promise of a new heavens and a new earth. It is a potent aid to reverence, devotion, recollection, and self-transcendence. Read more here (Part I) and here (Part II).